Cross-country skiing puts you into the beauty of winter. Suitable for a variety of skill levels, groomed and un-groomed trails are available for your enjoyment. Please ski safely and within your limit of control. Ski to the right when approaching other skiers or when being passed by other skiers. TRACK RIGHT! Dress in layers and always wear hats and gloves. Carry extra wax. Ski with a friend, especially at night. There are miles of trails designated for X-C skiing. The only groomed cross-country ski trails in the Allegheny National Forest are Laurel Mill Cross-Country Ski Trail (outside of Ridgway), and the access road to Rimrock Overlook (off SR 59 southwest of Bradford). Un-groomed trails include Westline X-C Ski Trail close to the Westline Inn. Trails are clearly marked with blue diamond-shaped markers on trees. Forest trail policy prohibits the use of a saddle, pack or draft animals on hiking or cross county ski trails. The Westline Cross-Country Ski Trail offers 9.8 miles of rugged forestland trails. The trailhead is located 11 miles south of Bradford, PA via U.S. 219 and State Route 59, via Forest Road 455. Facilities at the trailhead include hardened parking and informational signing. 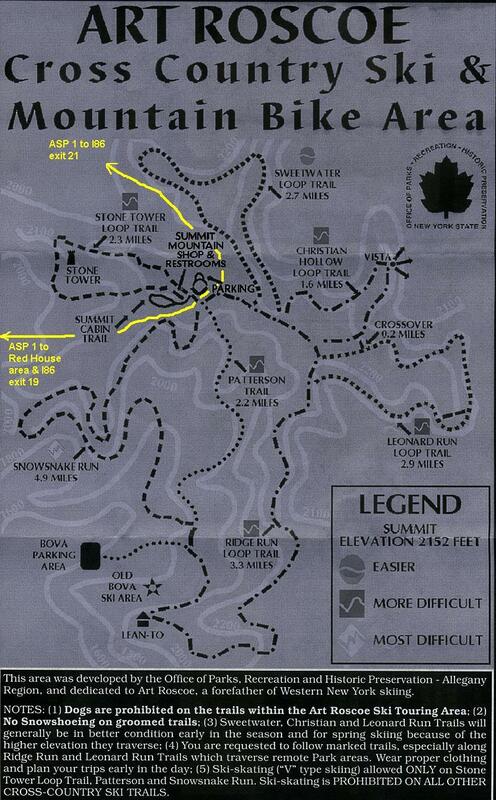 The trail system consists of several loops of varying skill levels: Short Circuit Loop (1.5 miles – easy); Inside-Out-Loop (1.5 miles – more difficult); Ledges Loop (1.6 miles – more difficult); Boo-Boo’s Delight Loop (1.1 miles – more difficult) and Thundershower Trail (4.1 miles – most difficult). The Allegany State Park in New York is easily accessible via Interstate Parkway from Bradford, Pennsylvania. Driving distance from the hotels in Bradford, to the gate at the park, is approximately 6 miles. You can enjoy cross-country skiing on the 35+ miles of trails at the Art Roscoe Recreation Area; 18 miles are groomed, 25 miles are back-country. Rentals are available at the Summit Mountain Shop.